Just move right in and enjoy this more than immaculate family home on perfect Lago Lindo street backing on to treed park and walkway with partial view of lake! Features of this completely upgraded home include a modern white kitchen with all the extras, pull out pantries, newer appls,and dinette overlooking family rm. The dining rm is formal and living rm has vaulted ceiling and bay window. 3 large bdrms including MB with 2 mirrored closets and 3 pce ensuite. 3rd level is dev.with lovely family rm with new gas insert fp, 2 pce bath with ceramic tile and 4th bdrm. 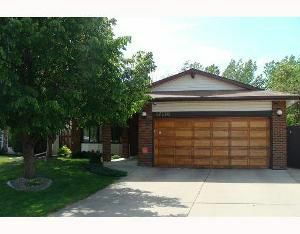 Bright laundry rm with tile flr and cupboards and an inside entrance to dble heated garage complete 3rd level. Bsmt is fd with rec rm, storage rms and utility rm.Home has been painted professionally in todays colors! Yard is fenced, beautifully landscaped with auto irrigation & features 2 level deck with new Trex surface and gas hook up for bbq! This beautifully maintained home is an absolute must to see! !